What Can An Outsourcing Partner Do For Your Online Learning Initiatives? Developing a good quality e-learning requires expertise across many different domains. You need a team of highly qualified and talented people to execute the creation of a digital learning program that can actually make an impact. But such a team never works in isolation. The course they create has to pass through the scrutiny of many different stakeholders and subject matter experts to ensure its potency. Needless to say, this process is long and tedious, usually filled with many unforeseen hurdles. However, business scenarios usually don’t allow the luxury of spending too much time on e-learning development. Since new products and services are introduced very frequently now, the cycle to update skills and knowledge is also shortened, making e-learning course creation a rapid activity. E-learning development requires a diverse team consisting of instructional designers, subject matter experts, authoring tool experts, technical support staff, and multimedia experts. If you set out to maintain a team of these varied professionals in-house, then the hiring and retaining process will prove to be a nightmare. 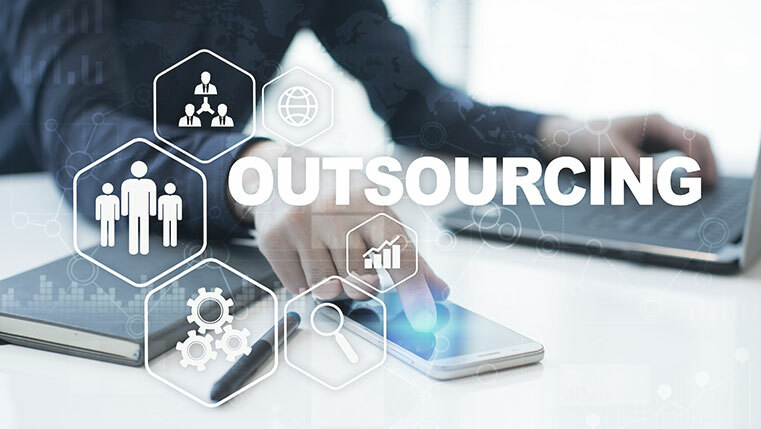 When you partner with an outsourcing vendor, you instantly gain access to their already proficient and well-coordinated team of experts. Such a team can carry on your development process without any hindrances, and deliver quality output in a speedy way. The training needs of any organization are going to change constantly, depending on a wide array of aspects. Adapting to these changes means hiring or firing people, introducing new technology, learning new processes, and keeping up to date with the latest in the world of learning. As an organization, this can prove to be a cumbersome task. When you outsource your e-learning creation, you just need to make a phone call or send an email to adapt your digital learning program as per the changed landscape. Outsourcing allows you to effortlessly scale or modify your digital learning program. Outsourcing can significantly speed up the e-course development process. If you choose to hire a vendor based out of a different country than yours, they can speed up development just by utilizing the time difference between the two countries. For e.g., if you are a US-based company and you choose to outsource your e-learning development to India, then this allows you to work almost round the clock. The development team in India can work on the course during their daytime and you can review or approve it during yours. This maximizes resource utilization and ensures faster delivery. When a large number of people are involved in the development process, things are bound to get a little messy. But outsourcing e-learning development to a good vendor, don’t let too many cooks spoil the broth. By using a set development process, vendors handle the development process step-by-step. They involve stakeholders at regular intervals and give ample scope for reviews. With this, the vendor can identify any problems at the grass root level and avoid time-consuming revisions at the later stages. Outsourcing your e-learning development process can prove to be much cheaper than doing it in-house. A good e-learning vendor can reduce timelines significantly by making the most out of its highly diversified development team. Since experienced vendors also use licensed versions of all the tools and resources used for development, no legal issues surface later on. Also, an e-course created by an experienced vendor will be more impactful when it comes to imparting knowledge and skills to your learners. This can greatly increase employee productivity, education, and work quality, which improves your return on investment. So instead of going trial and error with training programs that could be game-changers for your employees, hire a competent vendor who can create high quality digital learning material for the best results.